Elia Viviani (Team Sky) took the victory on the first stage of the 2015 Eneco Tour in a chaotic sprint which saw him beat Danny van Poppel (Trek Factory Racing) and Jean-Pierre Drucker (BMC) to the finish line in Bolsward, the Netherlands. It seemed nearly all the sprint teams had used up their lead-out trains early on a fast run-in to the finish, creating a messy sprint as each of the fast men jostled for position heading into the final kilometre. André Greipel (Lotto-Soudal), who was making his first appearance since dominating the sprint at the Tour de France, was the first to launch his move but surprisingly ran out of power with a couple of hundred metres remaining and allowed Italian Viviani to jump off his wheel and past him. Van Poppel made a move to match Viviani and RideLondon-Surrey Classic winner Drucker followed, but neither were able to match the Sky man as he took the first spoils of this year’s race. The 183.5km day, which saw the race ramp-up on the final two circuits in Bolsward, was blighted by crashes as a six-man break stayed away for much of the race, however there didn’t appear to be any serious casualties. The break, consisting of Frederik Veuchelen (Wanty-Groupe Gobert), Laurens De Vreese (Astana), Nathan Haas (Cannondal-Garmin), Jesper Asselman (Roompot Oranje Peloton), David Boucher (FDJ) and Nico Denz (Ag2r-La Mondiale), managed to stretch out a maximum gap of 7-25 before the time began to tumble. They were finally brought back shortly after taking on the three sprint time bonuses of the Golden Kilometre at around the 24km mark, with four riders of the group holding out just ahead of the peloton until around 17km remaininf as the race geared up towards a bunch sprint. The time bonuses from the Golden Kilometre leave De Vreese, Denz, Drucker and Haas all inside the top-10 on GC . All riders were given the same time as the leader after a crash in the finale of the race, however time bonuses mean there’s a ten second gap to the leader from the tenth place onwards. 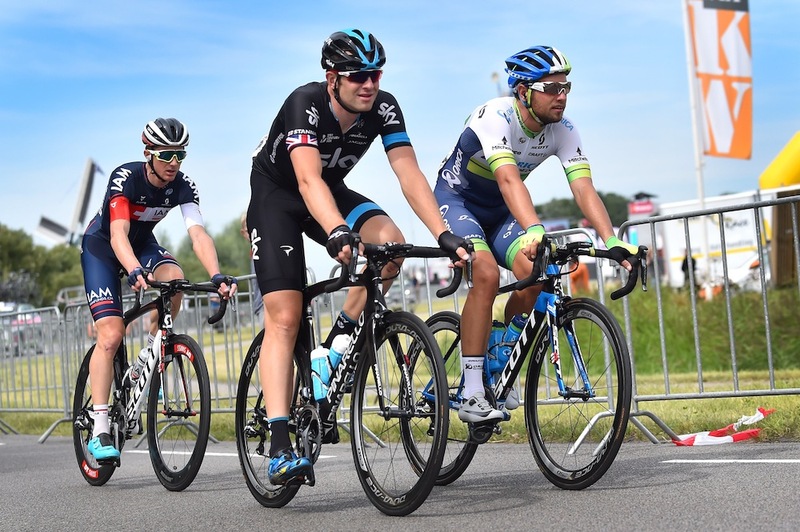 Britain’s Ian Stannard (Team Sky) came through the stage unscathed, finishing in 152nd place. Viviani took the bonification on the line and now sits atop the GC with four seconds over Van Poppel, as the peloton head to another likely sprint stage on Tuesday. The second stage sees another day of flat circuits in Breda on a 181km course.